For me, Lacy’s Shift Retreats have been those once-in-a-lifetime experiences that changed everything . . . and continues to change everything. Lacy puts incredible thought, planning and intention in creating her retreats, while at the same time achieving flexibility and a go-with-the-flow approach to making sure attendees’ needs are met. I attended Shift Bali after first attending Shift Costa Rica 10 months prior. 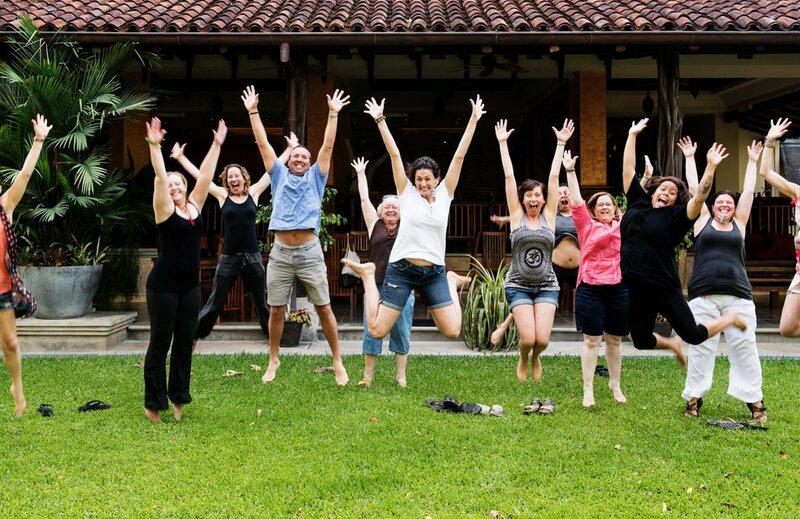 During Shift Costa Rica I was able to do a deep dive into asking what it is I need in my life, and Shift Bali was where I gained clarity about what I desire in my life. For those looking to go big, go deep and see, feel and experience change, Shift Retreats are the place to begin. Shift gave me so many things I didn't even know I needed. I've done many years of therapy and a spiritual psychology graduate program, and I have a library of self-help books (okay, I haven't read ALL of them), so I consider myself to be fairly experienced in the art of working on my own stuff. And I have to say, my Shift weekend was one of the most valuable, transformative, supportive experiences I've ever had. Lacy and Kayla created a truly magical space in which I felt so deeply cared for, safe, loved, and open. Every single detail is so carefully thought out and executed, and although Shift isn't "pampering" in the sense of going to a spa, I felt absolutely pampered by the attentive, personal experience Lacy crafted. I came to Shift depleted, exhausted, and addicted to my phone. I left feeling calm, peaceful, rested, centered, and totally secure in the knowledge that I am exactly where I'm supposed to be. I took a before and after picture, and the difference after three days is unbelievable. Lacy is a big proponent of the idea that big changes don't have to take a long time or require suffering to achieve, and what I experienced and saw in others at Shift is proof that she's right. (She usually is.) I really can't recommend Shift highly enough, and I'm so looking forward to attending my next retreat. I admittedly stumbled into this retreat a little bit unprepared. I wasn’t focused on change, or mindful of, well anything. I was entirely wrapped up in the swirling orbit of my life. My work as a CEO, my kids, my relationship, my family, my responsibilities…I was Wrapped. Up. I was all but dumped by a car at the doorstep of this weekend with Lacy and her team, over packed and under aware of what is possible. The effect of the environment that Lacy creates is instantaneous and the work that we did and the care that was taken with me and every detail of this weekend was restoring to say the very least. In an incredibly short time I was shown a path to myself and a connection with our group that was both well-worn and brand new. It all became possible and step by step, meditation by meditation, and let’s be honest, meal by incredibly delicious and nurturing meal, I began to shift. The weekend felt both long and short and I could barely recall the harried person who had entered panting just a few days earlier. I was steeped in a new tradition that had my heart at the center and left packed with tools to continue my journey where and when I was able. The value that I got out of the weekend retreat made me marvel at what could be possible in the longer journeys. I will definitely return again and again. Lacy and her team are truly gifted at offering you YOU in a way I frankly, didn’t believe in until my first SHIFT experience. It is a rare, authentic, living, breathing gift. I recommend it to everyone. YOU WANT TO FEEL PEACEFUL IN YOUR LIFE. You are so tired of feeling not good enough and would like to feel empowered and hopeful. You wake up and immediately battle the negative thoughts that play on repeat in your mind. Wouldn't it be nice if starting the day felt good? You have felt blocked for some time and are going through the motions. There is a major area of your life - your career, your relationships with others or your relationship with your body that is seriously lacking shine. You are ready for ease and flow. Your shelf boasts plenty of self-help books and you are no stranger to therapy. Your linear mind has a good idea of what to do but you can't seem to make the changes real in your life. Emotional eating has taught you that though eating your feelings is sometimes delicious it's ultimately an empty pursuit that leaves you feeling gross. You know it is time to let go of unhealthy habits or addictive behaviors that are no longer serving you. Hearing the words "find your purpose" no longer feels inspiring. You're tired, frustrated and wondering if anything is ever going to change. You are open and willing and this is resonating with you on a level you can not quite explain. Our time together will be a rebirth for you. It is an opportunity to step into your power and become what you truly are. Join me for a journey into your true self. Join me for the unearthing of deep, inexplicable joy. Join me for the transformation you've been waiting for. Ready to begin your at-home shift? Thank you, check your inbox.